The humidity sensor is a small capacitor consisting of a hygroscopic dielectric material placed between a pair of electrodes. 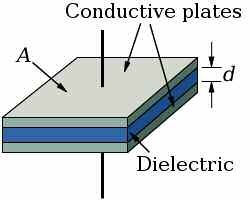 Most capacitive sensors use a plastic or polymer as the dielectric material, with a typical dielectric constant ranging from 2 to 15. When no moisture is present in the sensor, both this constant and the sensor geometry determine the value of the capacitance. At normal room temperature, the dielectric constant of water vapor has a value of about 80, a value much larger than the constant of the sensor dielectric material. Therefore, absorption of moisture by the sensor results in an increase in sensor capacitance. At equilibrium conditions, the amount of moisture present in a hygroscopic material depends on both ambient temperature and ambient water vapor pressure. This is true also for the hygroscopic dielectric material used in the sensor. By definition, relative humidity is a function of both the ambient temperature and water vapor pressure. There is a direct relationship between relative humidity, the amount of moisture present in the sensor, and sensor capacitance. This relationship is at the base of the operation of a capacitive humidity instrument. Click here to download the Capacitive Sensor technical note.